Using this recipe and this chocolate peanut butter, I have created a delicious treat! It took a couple tries, but this final batch is perfect! I think since it’s a muffin, it can be eaten any time. A perfect weekend breakfast (or anytime breakfast, because why not? 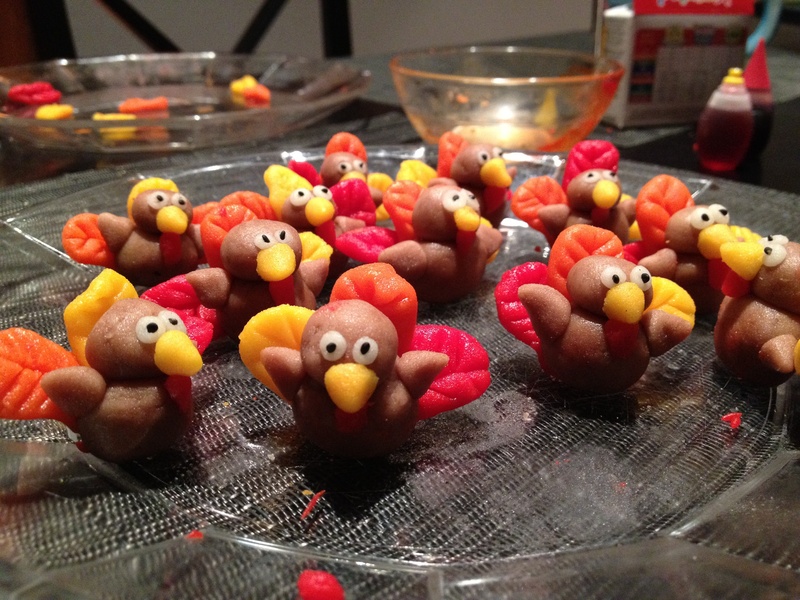 ), a great dessert, a tasty snack, a yummy addition to any potluck…anything you want it to be! That’s the best part of a chocolate muffin. Chocolate muffin, with chocolate chips mixed into the batter, with chocolate peanut butter baked on top. 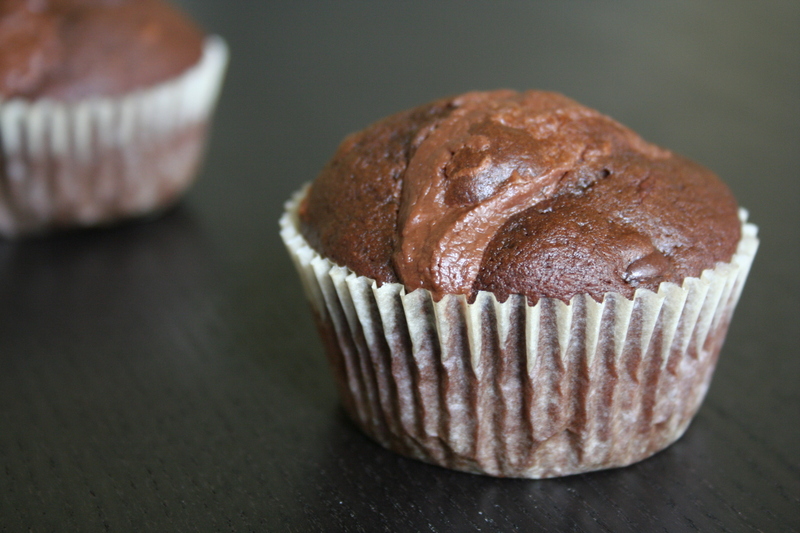 “Chocolate chocolate chocolate peanut butter muffin” could be a more accurate title. I had to make a few adaptations to the recipe listed above. I kept the cupcake batter the same except I added more chocolate chips, and used a dairy-free milk. The first time I made this recipe, I made the peanut butter swirl the way it is listed in the original recipe (except used chocolate peanut butter instead of regular peanut butter). Because of the extra ingredients already in the chocolate peanut butter, it became a very thin mixture, and didn’t soak into the cupcake. It spread out, bubbled across the top of the pan, and burned. Terrible! Totally not fit for bringing to a potluck, or as a treat for coworkers, or anything…except some tastes of parts that could be pulled away from the burntness. Lots of tastes, actually. I decided that the chocolate peanut butter could hold up on it’s own, and so skipped the extra ingredients the next time I baked them. I just plopped a teaspoon or so of chocolate peanut butter on top of the cupcake batter, and stuck them in the oven to bake. Voila! 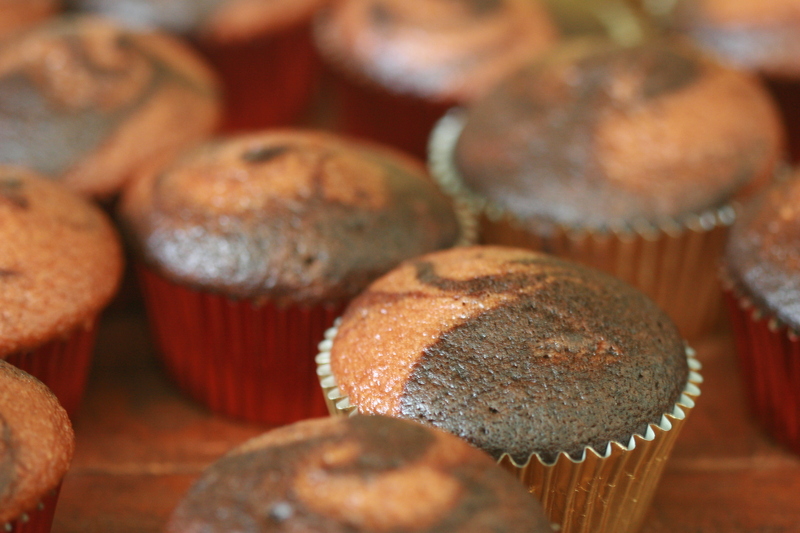 Delicious, perfect looking triple chocolate peanut butter muffins! Why didn’t I think of that the first time? Here’s my version of the recipe. Enjoy! Drop a small spoonful of the chocolate peanut butter on top of the chocolate muffin batter. Swirl together using a skewer or knife. Bake 20-22 minutes or until a toothpick inserted in the center comes out clean. Let cool in the pan 10 minutes, then transfer to a wire rack to cool completely. As of two weeks ago, I had never watched a football game. Not ever. Last year, another teacher asked me during our recess duty what I had done for the Super Bowl. I replied something like, “The Super Bowl was this past weekend? I had no idea.” To which he jokingly said, “Hey, have you ever heard of this thing called football? It’s a sport. People play it. There are fans.” These jokes continued for most of the school year…Of course I knew what football was…but had I ever watched a game? No. Did I care? Not really. Which is a huge step from not knowing that the Super Bowl even happened. Mostly I’m excited about the Super Bowl parties because the first one is all of my best friends hanging out (in one room, while some of their partners watch the game with all types of seriousness), and the second will feature team-themed food (New York themed food and New England/Boston themed food…and they are going all out. New York: New York cheesecake squares, Jewish deli corned beef Reubens, Kosher pickles and cole slaw, Brooklyn Lager. New England: New England clam chowder, Maine lobster-filled lobster rolls, Cape Cod potato chips, South Boston Irish car bombs, Sam Adams Boston Lager). Who doesn’t like a themed food party? Theme? Check. Easy to eat with your fingers while watching the game or holding a beer in the other hand? Check. Delicious? Check. I guess I’ll be eating cupcakes, cheesecake squares, and drinking beer. And maybe watching the game a little. Sounds like a good Sunday to me! Whisk the almond milk and vinegar in a measuring cup and set aside for a few minutes to get good and curdled. Beat together the soy milk mixture, oil, sugar, and vanilla in a large bowl. Sift in the flour, cornstarch, baking powder, baking soda, and salt, and mix until no large lumps remain. Fill cupcake liners 2/3 full. Bake for 20-22 minutes, until a toothpick inserted into the center comes out clean. Transfer to a cooling rack, and let cool completely before filling and/or frosting. To Make The Filling: Combine the 1/2 cup cream with 1/4 cup of the milk and cook over medium heat until bubbles begin to form around the edge of the pan. Immediately add 1/4 cup of the sugar and the salt. Stir until dissolved. Remove the pan from the heat. In a small bowl, combine 1/4 cup of the milk with the cornstarch and whisk to remove lumps. Whisk in the 2 eggs. Add the hot cream mixture in a thin stream, whisking constantly. Return to the mixture to the saucepan, bring to a boil, and cook over low heat, stirring constantly, until the custard thickens and is smooth (about 5 minutes). Remove from heat and stir in the 1/2 teaspoon vanilla. Allow to cool to room temperature. To Make The Chocolate Ganache: In double boiler, stir the chocolate pieces and 2 tablespoons butter until they are completely melted. Remove from the heat and, stirring constantly, add the 1/4 cup cream in a thin steady stream. Mix vigorously until smooth. Stir in the 1/2 teaspoon vanilla. To Assemble the cupcakes: Cut a cone shape out of the top of each cupcake. Cut the tips off the ends of the cones (this is when you get to sample the cupcake). Put a dollop of custard in the hole, and then put the top of the cone shape back on the top of the cupcake, hiding the custard filling. Spread chocolate ganache evenly over the cupcake. Eat. Enjoy. Have a second one! Cupcakes: recipe the same, except I substituted Bob’s Red Mill Gluten-Free Flour Mix instead of wheat flour. Ganache: recipe the same, except I didn’t include the mint leaves at all. Icing: recipe the same, except I used Earth Balance margarine and added 1 tsp. pure vanilla extract. This year, I am thankful for so many things. Some of those things include that I got to celebrate Thanksgiving twice this year! Both times were with wonderful friends and family (well, all of them are like family now). For my second Thanksgiving, there are lots of traditions. One includes cooking with and drinking lots of Maker’s Mark whiskey, and so when I was brainstorming cupcake flavors of course I had to include Maker’s. And when I was thinking of cocktails that include whiskey, we realized that a bomb combination would be to make Ginger Whiskeys! Yum. Preheat the oven to 350º F. Line a cupcake tin with papers. Set aside. Stir the almond milk and apple cider vinegar together well and set aside (the mixture will curdle). Grate or zest your ginger while you wait for the curdling. In a large mixing bowl, stir together the flour, sugar, baking powder, baking soda, and salt. In another mixing bowl whisk together the almond milk mixture, canola oil, and vanilla extract. Add the wet to the dry ingredients and beat until smooth using a hand-held mixer, stopping once to scrape down the sides of the bowl. Add the ginger at the very end, and mix to incorporate. Fill your cake pan with the batter. 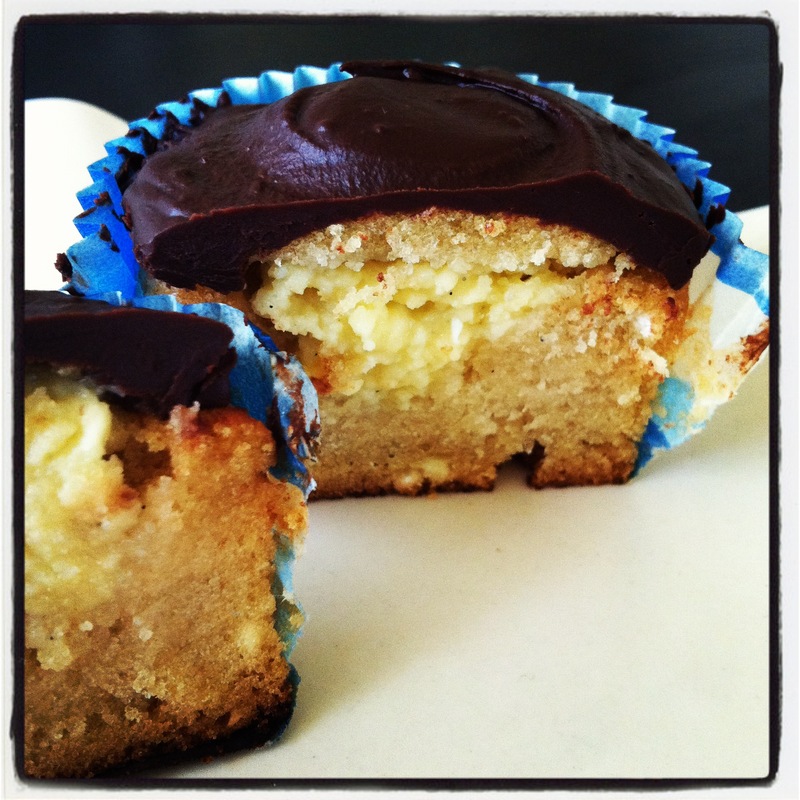 Bake for 23-26 minutes, until a cake tester inserted in the middle of a cupcake comes out clean. Let cool in the pan for 15 minutes, then when luke-warm, remove cakes from the pan and place on a wire rack. Let cool completely before frosting. In a small saucepan, melt the brown sugar and butter over a medium low heat. Stir vigorously to create a smooth texture. Pour the half & half into the brown sugar blend, using a whisk to incorporate. Whisk in the powdered sugar. Continue stirring until sugar has completely dissolved. Add the Maker’s Mark whiskey and vanilla extract. Remove from heat and let cool. Make small holes in the tops of the cooled cupcakes with a fork and pour the glaze over the cakes – let the glaze seep in, and re-pour if you want extra. Refrigerate to set. Beat the butter and cream cheese together with an electric mixer. When you have a smooth, fluffy consistency, add the vanilla extract and confectioner’s sugar half a cup at a time. Mix until fully combined. 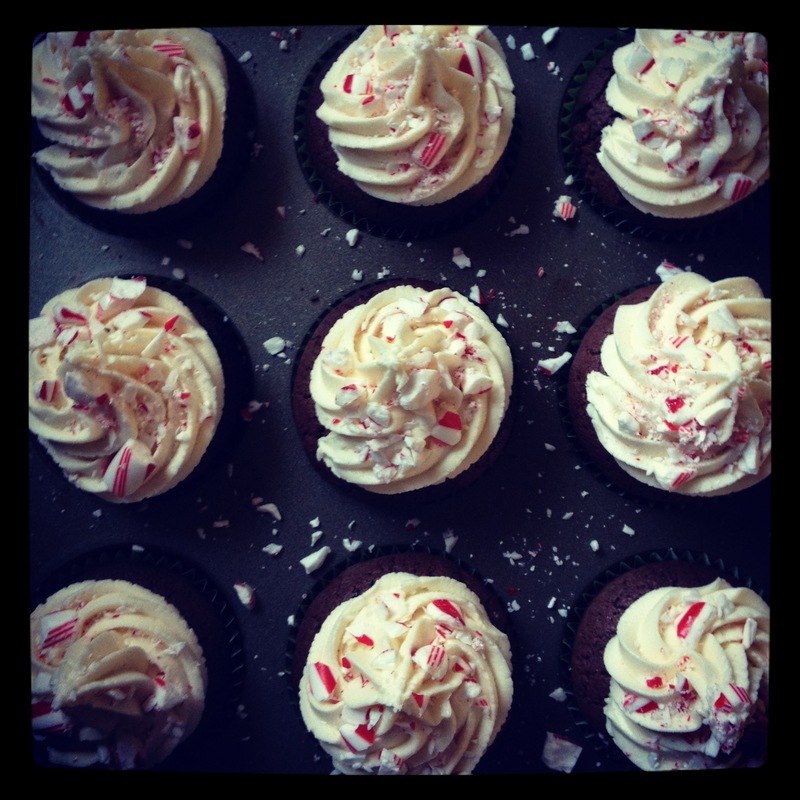 Add more sugar if you want a thicker frosting, but be aware that it can get quite sweet quickly! Make it a little thicker than you want it, and then add the ginger and lemon zest – it will thin out the frosting just a little bit. 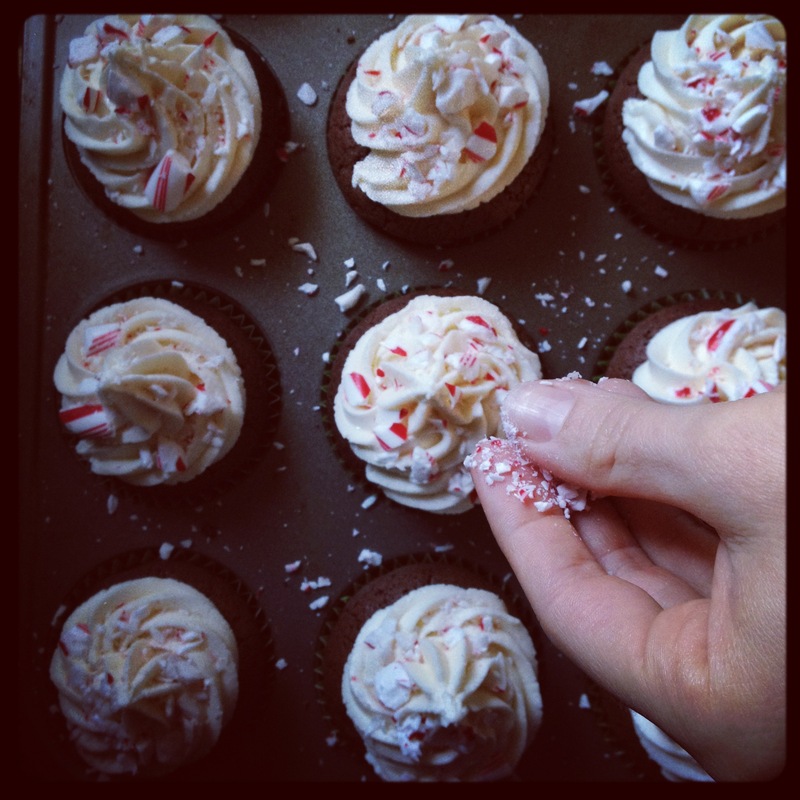 Spread frosting over the glazed cupcakes. Eat and enjoy! Lemon, Chocolate, Champagne, Oh My! 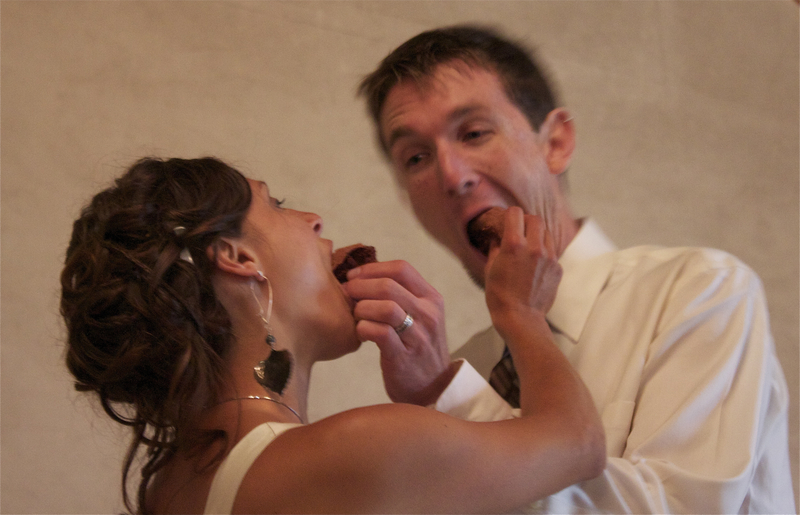 Bria and Dave’s wedding was fantastic and fun – the perfect mix of serious, thoughtful, goofy and joyous. I was honored to bake them their wedding cake and cupcakes! In three flavors, no less! I’m sorry I don’t have the recipes right now as links but you can look them up in my blog archives. 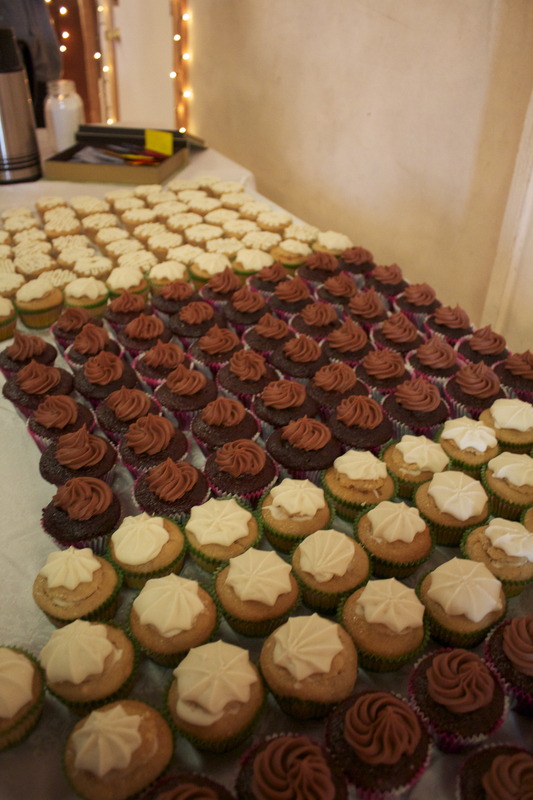 These cupcakes look beautiful and received “wows!” from kids and adults alike. If you have favorite chocolate and vanilla cupcake recipes, then these cupcakes couldn’t be easier to make. Find your favorite recipes* (as long as they have a similar batter consistency) and make them in separate bowls. You can about a cup of raspberry jam to the vanilla batter, and mix it in thoroughly. When you are ready to put the batter into the paper liners, use two 1/4 cup sized measuring cups and take a scoop of each flavor batter each measuring cup. Pour the batter into the paper liners from each measuring cup at the same time (one into each half of the liners) until the liners are 3/4 of the way full. Use a butter knife to swirl the batter around, or you can leave it half-and-half if you like that effect. 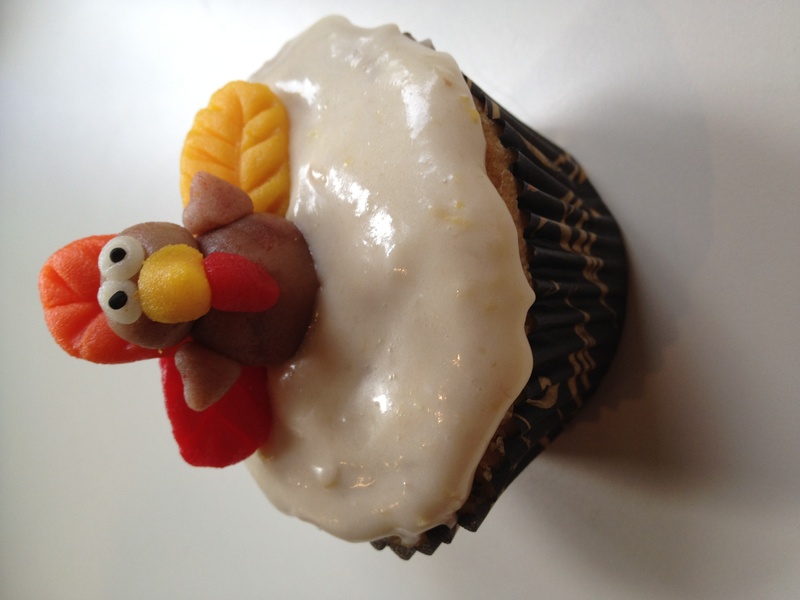 Follow your cupcake recipe for baking times (usually cupcakes bake for 20-22 minutes). 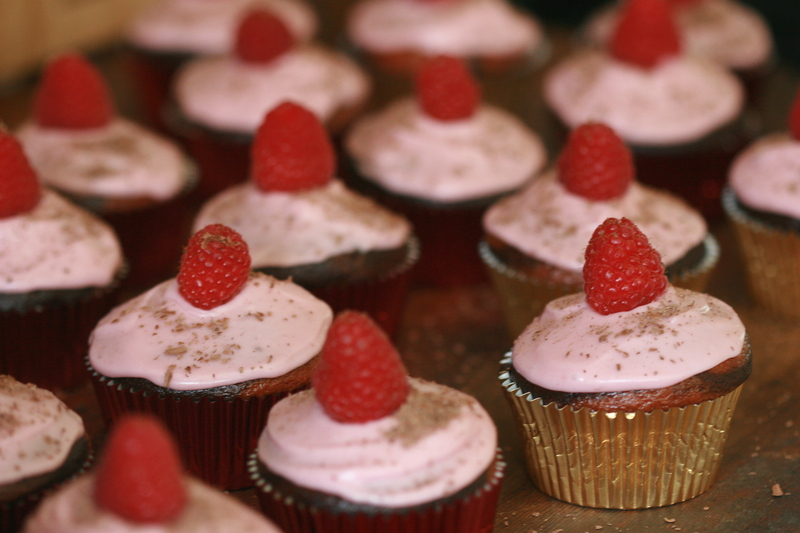 I topped my cupcakes with a Raspberry Cream Cheese Frosting (by adding raspberry jam to my favorite cream cheese frosting recipe). Top with curls of chocolate and a fresh raspberry, and you’re set to impress! *I used the basic vanilla and chocolate cupcake recipes from Vegan Cupcakes Take Over The World. In the midst of wedding cake preparation craze, I have baked a sweet treat to take to my friends Kate and Lesley’s birthday party. And, more miraculously, I have found the time to take pictures and post them with a recipe for you, before the event! I am never this timely with my posts, sometimes waiting days or even weeks before posting the recipe and pictures. However, somehow I have managed to get these uploaded onto the computer and they’re itching to get to your screens, eyes, kitchens, ovens, and finally into your mouths and bellies. The party is taking place at a local lake (okay, okay, so “Under The Lake” would probably be a more correct title for this post…), and I know these fabulous women from my elementary teaching credential program, so it seems like a fitting occasion to bust out my Little Mermaid cupcake wrappers and crack a few smiles when I deliver them tomorrow! Hopefully, the cupcakes will also crack a few smiles on my friends’ faces and in their tummies – one of them is gluten-free, so these cupcakes are too. 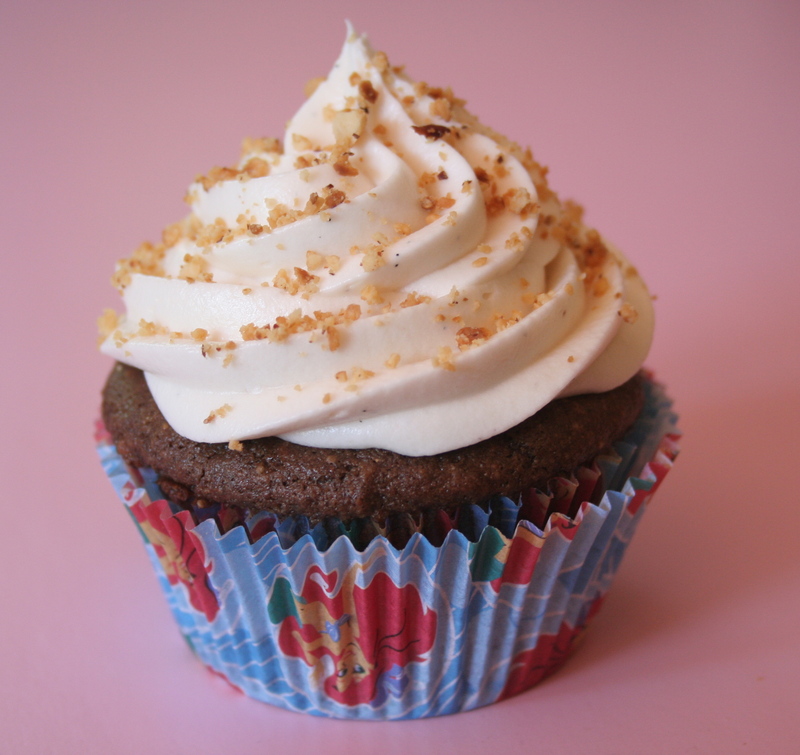 A crunchy rich Chocolate Hazelnut Cupcake topped with a Cream Cheese Vanilla Bean Frosting, and extra toasted hazelnut crumbs sprinkled on top…Well, I can’t imagine a better birthday dessert! Scuttle: It’s a dinglehopper. Humans use these little babies… to straighten their hair out. See? Just a little twirl here and a yank there and voila. You’ve got an aesthetically pleasing configuration of hair that humans go nuts over. Ariel: Look at this stuff, isn’t it neat? / Wouldn’t ya think my collection’s complete / Wouldn’t you think I’m the girl / Girl who has everything / Look at this trove, treasures untold / How many wonders can one cavern hold? / Looking around you’d think / Sure, she’s got everything / I’ve got gadgets and gizmos aplenty / I have whoozits and whatzis galore / You want thingamabobs? I’ve got twenty / But who cares? No big deal / I want more. 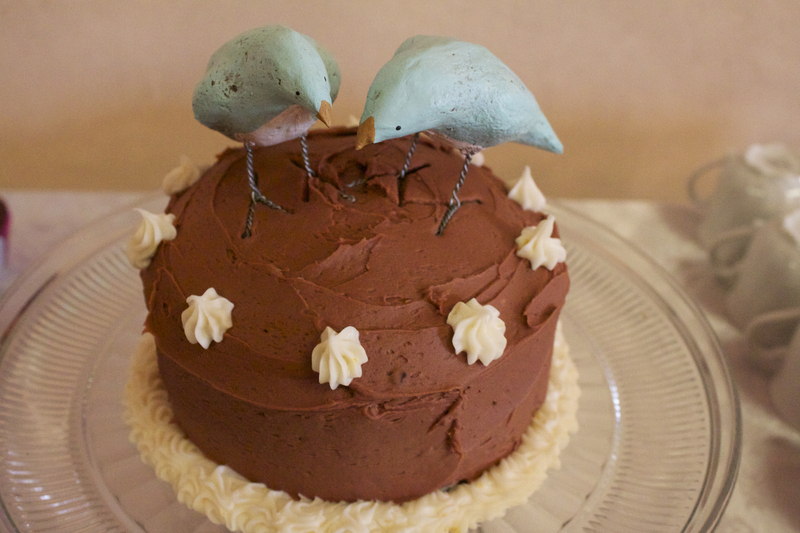 I have a few reliable fall-back gluten-free cake recipes that I always use. However, I wanted to add a hazelnut twist to a chocolate cupcake, and to do that I wanted to add both hazelnut meal (to get a little crunch) and hazelnut butter (to disburse and reinforce the flavor). I had to change the amount of liquid, oil, and flours to accommodate for the nut butter addition to the recipe, and I honestly wasn’t sure what was going to happen when I put these babies into the oven. When I was finally brave enough (and couldn’t stand the suspense anymore!) I peeked into the oven…and the cupcakes had risen beautifully, created lovely cracked tops, and didn’t show any signs of sinking down middle syndrome! 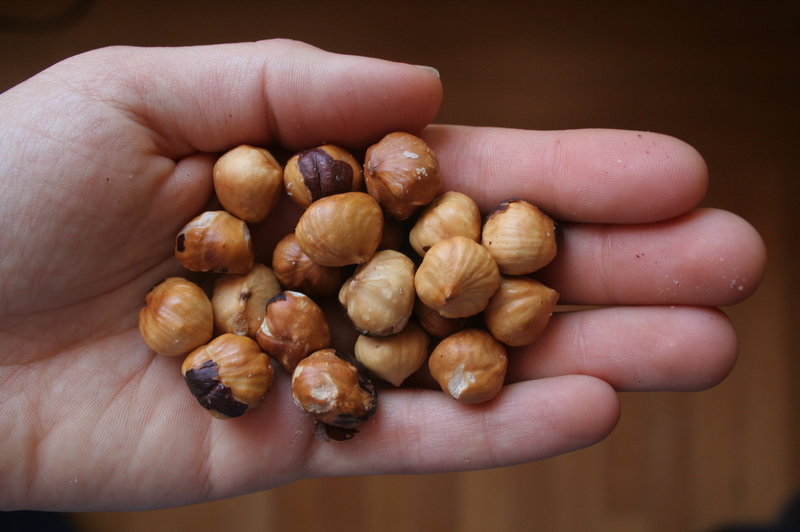 They are a little dense because of the hazelnut butter, but dense in a good way, if you know what I mean. Like, nutella-dense. Mmm. 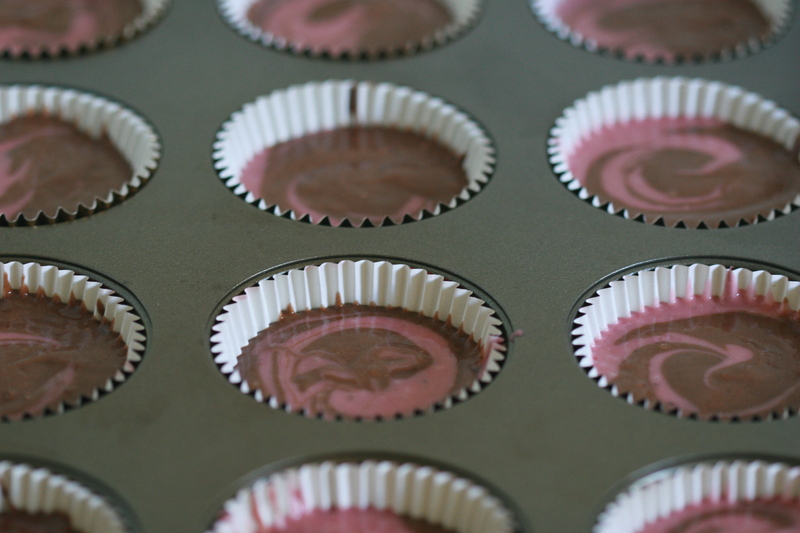 Pre-heat your oven to 350º F. Place cupcake wrappers in a muffin tin. Set aside. Measure out your almond milk into a medium sized bowl, and add the vinegar. Mix vigorously, and set aside to curdle. Once it is curdled, add the oil, sugar, vanilla, and almond extract and mix to combine. In a large bowl, sift the tapioca flour, cocoa powder, sorghum flour, quinoa flour, baking powder, baking soda, and salt. Add the xantham gum, flax seed, and hazelnut meal. Stir together so everything is evenly distributed. Create a well in the dry ingredients, and pour the wet mix into it. Mix with an electric mixer, or by hand with a whisk until there are no lumps. Because this is a gluten-free recipe, you don’t have to worry about mixing too much. Once there are no more lumps, add the hazelnut butter by the spoonful, and continue mixing until the batter reaches a smooth consistency. Fill your cupcake tins about 3/4 of the way full. Bake for 20-22 minutes, until a toothpick inserted into the center of a cupcake comes out clean. Sebastian: Ariel, please! Will you get your head out of the clouds and back in the water where it belongs? Ariel: I’ve never seen a human this close before. Oh… he’s very handsome, isn’t he? Scuttle: I don’t know, he looks kind of hairy and slobbery to me. Ariel: No, not that one. The one playing the snarfblatt. Beat the margarine, shortening, and cream cheese together with an electric mixer. When you have a smooth, fluffy consistency, add the vanilla bean paste and confectioner’s sugar one cup at a time. Mix until fully combined. Add more sugar if you want a thicker frosting, but be aware that it can get quite sweet quickly! 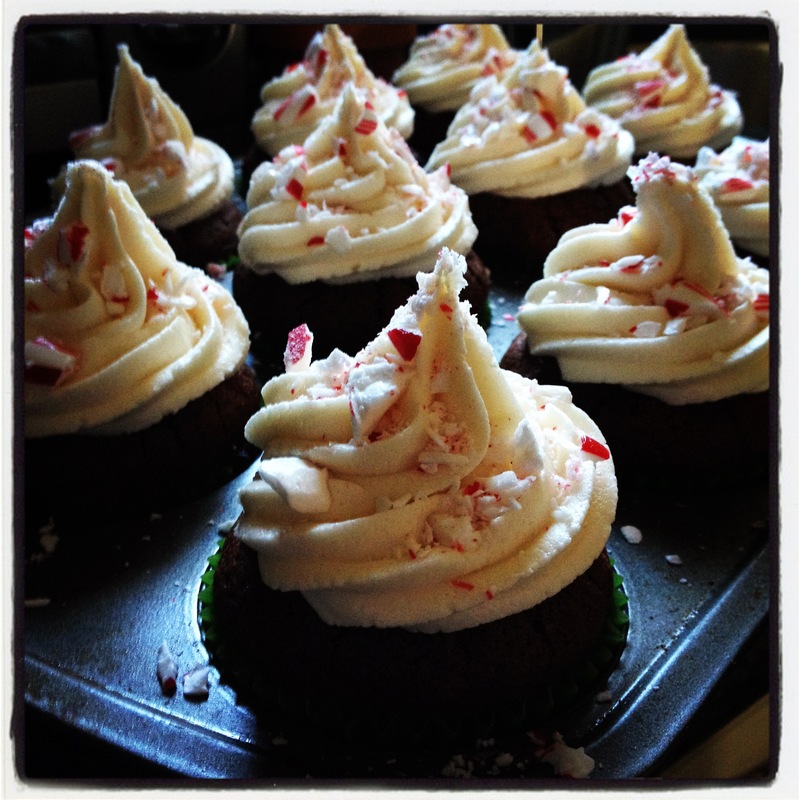 I piped the frosting directly onto the cupcakes, and then sprinkled some extra hazelnut meal on top to make a pretty addition, as well as add some extra flair and crunch to every bite. Fish: Guess who gonna be on the plate?